This book has everything you'll need to know the in's and out's of eBay. The info ranges from finding killer deals on ANY item you want, to selling anything with a breeze and even how to make a living off "flipping" items on eBay! 1. How to buy safely from eBay and score some CRAZY good deals. 2. How to sell almost anything effectively and easily. 3. 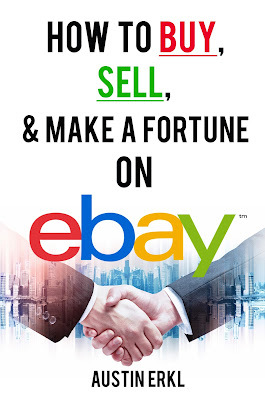 How to make a living off eBay using over 3 different methods. This eBook may only be 15 pages, but other similar books are 100+ pages and literally ten of those pages might actually be useful. I cut straight to the chase, so every page is full of beneficial info. To make things even better, there are examples of everything that's gone over in this book. This makes it much easier to grasp the information and implement it to actually work. You are guaranteed to make and save plenty of money using my knowledgeable information. If you get stuck or have any questions, I left my personal email to contact me. eBay / E-Commerce "Guru's" will usually charge hundreds of dollars for service like this!